Best Pizza in Florida: Our 10 Favorites! Pizzas are one of those special dishes that encourage people to come together. Although it might sound cheesy (pun intended), this Italian staple is best when shared and is a hit at any kind of gathering or celebration. Who knew a mixture of dough, sauce and cheese could be such an influential meal? Crispy crusts, hearty sauces and, of course, an excess of cheeses can be found at all of our favorite spots in Florida! This Italian restaurant in Cape Canaveral has the tastiest wood fire and brick oven-style pizzas in the whole state. Zarrella’s homemade pies topped with fresh meats, vegetables and cheeses are perfect for sharing, but are delicious enough to finish yourself. Meat lovers—give their pepperoni and sausage pizza a try. You won’t be sorry! CJ’s is a favorite among locals in the Longwood area. The servers make you feel right at home and the pies are perfect to eat in store or take out to a party or gathering. Create your own with customizable toppings or choose from any of their other small or large pies! Since opening in 2001, Andiamo has brought New York style pizza pie to the south. 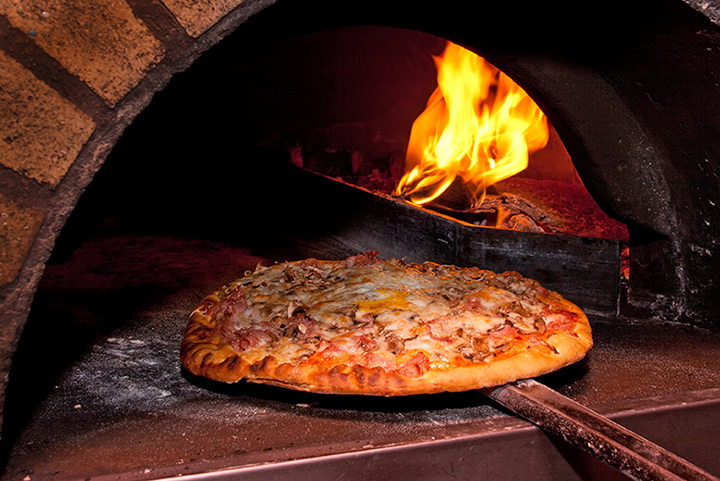 With fresh dough made daily, they deliver the most authentic and traditional pizzas in South Florida. Their Capricciosa pizza topped with prosciutto and artichokes is a must-try. Located right around the corner from Florida State University, this pizza joint has been the place to go for a “slice as big as your head” since 1999. These larger-than-life pies are great for anyone with a hefty appetite. Even their single slices alone are plenty to fill someone up! Known as Tampa’s favorite pizzeria, Eddie And Sam’s ships in real New York tap water to create the most genuine pizza dough you’ll find in Florida. Order the chicken parmigiana pizza for something tasty and filling. The oldest pizzeria in Jacksonville is family-owned and takes pride in their scratch-made selections. Since 1956 Joseph’s has created a welcoming environment that’s fantastic for socializing over a delicious pie. Head to one of their two locations to try a slice or two, and finish it off with their delicious gelato. This quirky and funky restaurant has some of the best deep dish and traditional pizzas in the Sunshine State! Pair your pie with a fizzy homemade soda to satisfy your pizza craving. Come watch Downtown House of Pizza’s chefs create delectable pies in their entertaining open kitchen. Since opening, they’ve used over 520,000 pounds of mozzarella according to their website. Create your own “masterpiece” or try one of their specialty pizzas! Craving a cheesy pizza after a day at the beach? Then head over to Constantine’s in South Daytona for a legendary meal. Their 12-inch Pizza Frit with fried dough is a favorite among this pizzeria’s patrons. After spending the day exploring the historic city of St. Augustine, there’s nothing better than ending your adventure with a pizza from Pizzalley’s Chianti Room. Their classic margherita pizza is always a huge hit!